What happenened to the site of Hitler's demise? As visitors to Berlin wander the city, hitting all of its top landmarks, they may wonder what happened to one of the most influential figures in Germany history. Adolf Hitler left an undeniable stamp on the capital of Germany - both its history and architecture. He moved the famed Siegessäule, designed the illustrious Olympic Stadium, and engineered the Holocaust. Other sites exclusively related to Hitler are harder to find. Germany has been careful to avoid making these sites of pilgrimage. One such site is Hitler's bunker where he committed suicide along with some of his most ardent followers. The bunker was largely destroyed during WWII and has since been covered up and was forgotten for many years. The site of demise for one of the 20th century's most sinister villains is now just a parking lot and plaque. Discover the background of this infamous site and how and if you should visit Hitler's Bunker in Berlin. Before Hitler died of a self-inflicted gunshot wound in a bunker beneath the city he abandoned, the Führerbunker was established in 1936 as an air-raid shelter beneath the Reich Chancellery. At the time of its construction, it cost 250,000 Reichsmark and was 15 meters underground, reinforced by at least 3.5 meters of concrete. It was expanded in 1944, eventually consisting of 27 meters of tunnels and 30 rooms. The bunker featured a sophisticated ventilation system to allow for fresh air, filtering out potential lethal gas. It operated independent of the city with its own its own massive diesel generator. As the war intensified and raced to meet its final climax, Hitler took up full-time residence in the bunker on January 16th, 1945. The bunker became the headquarters of the Nazi regime as Hitler and his military desperately tried to turn the tide during the last weeks of World War II in Europe. On March 20th, Hitler honored the last of his soldiers before cameramen and photographers and descending into the bunker for the final time. In the last week of April, it became clear the war was lost for the Germans. Hitler married his long-term partner, Eva Braun, and together with their entourage, they committed suicide in the bunker on April 30th, 1945. Shortly after, the place was stormed by Russian troops where they discovered the grisly scene. Though it was only one of the Führerhauptquartiere (Führer Headquarters) used by Hitler, it is certainly the most famous. What Happened to Hitler's Bunker in Berlin? The bunker and many Reich buildings were destroyed by the Soviets and Allied bombing following the war. A bomb was detonated and the intricate channels and rooms of the bunker complex were buried under its own rubble in 1947. That doesn't mean it was completely destroyed. The underground complex lay in ruins, partly intact, until 1988–9 when the city undertook some reconstruction. The bunker was excavated, but still sealed off from the public. Above ground, the site remained unmarked and mostly covered by a nondescript car park. This was part of German policy to avoid neo-Nazis making pilgrimages to major Nazi landmarks. This changed in 2006 when a small plaque with a diagram of the space below was installed in time for the World Cup. 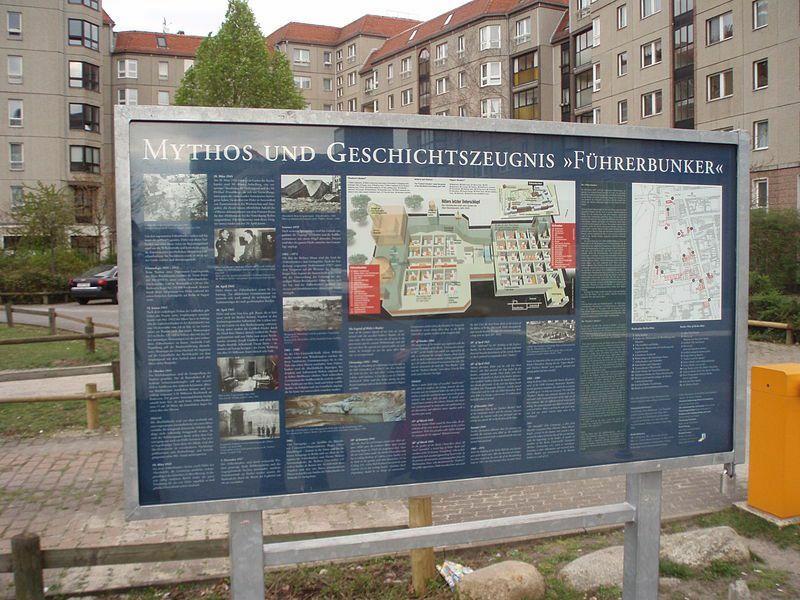 The East German residential buildings that surround the lot were prized housing under the German Democratic Republic, and still have a prize location near prime attractions in Mitte (central neighborhood). Today, a simple information board provides details about the history of the site. Installed by a tour company, Berliner Unterwelten, you might spot the site by tour companies stopping here to give information about Hitler's bunker. The easiest (and very appropriate) way to approach the site is from the Memorial to the Murdered Jews of Europe between Potsdamer Platz and Brandenburger Tor. From its easily found and well-marked location, walk to what was the Reichskanzlei which was at Wilhelmstraße 75-77 - now in den Ministergärten by Gertrud-Kolmar-Strasse in 10117 Berlin. A map of the bunker and other relevant sites can help you locate what remains of Hitler's bunker in Berlin. The closest U-Bahn/S-Bahn is Brandenburger Tor. Despite the bunker being off-limits to the public, multiple pictures of the interior of the bunker have been published.